A dinosaur from China sported a “bandit mask” pattern in the feathers on its face, scientists have said. Researchers came to their conclusion after studying three well-preserved fossil specimens of the extinct creature, called Sinosauropteryx. They were able to discern the dinosaur’s colour patterns, showing that it had a banded tail and “counter-shading” – where animals are dark on top and lighter on their underside. The study appears in Current Biology. The bandit mask pattern is seen in numerous animals today, from mammals – such as raccoons and badgers – to birds, such as the nuthatch. “This is the first time it’s been seen in a dinosaur and, to my knowledge, any extinct animal that shows colour bands,” co-author Fiann Smithwick, from Bristol University, told BBC News. There are a variety of ideas about why animals carry the bandit mask pattern. And the reasons might differ between individual species. 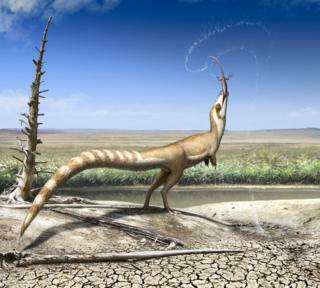 “We think that’s probably unlikely in Sinosauropteryx because there’s no real anatomical evidence that it could have defended itself well. It’s a small dinosaur and quite gracile (lightly built). “It would probably have been fast-moving, but in terms of a physical deterrent that you’d need to back up a signal like that, it doesn’t really have one. Instead, the team thinks the bandit mask served a similar function to the one seen in modern birds – which makes sense given the evolutionary relationship between the two groups. Scientists think one reason birds have it is to reduce glare from light reflected on feathers around the eye. This might be particularly important in environments where there’s lots of direct sunlight. “The analogy is athletes who paint a dark stripe under their eyes… it’s really beneficial for increasing your visual acuity,” said Dr Smithwick. But they might also camouflage the eyes, making them harder for predators to spot. Sinosauropteryx is known to have lived between 133 and 120 million years ago in north-eastern China. It was a small feathered dinosaur characterised by a long tail and short arms. The longest specimen is about a metre (three-and-a-half feet) in length. “One of these fossils was looked at about seven years ago, by a team that found pigment preserved in the feathers – this was in the form of melanin. This was a particular type of melanin that’s known to give ‘ginger’ or ‘rusty-brown’ colours in living animals,” he explained. Only pigmented feathers were preserved by fossilisation. So parts of the dinosaur’s body where they were not found were presumed to be white in life. Co-author Dr Jakob Vinther, also from Bristol University, travelled to China to take very high-resolution photos of the specimens. Some of these were normally lit, but others were taken using cross-polarising filters on the light and the camera. These filters reduce the glare that comes off the fossil under artificial light, allowing the scientists to see in detail where the dark-pigmented areas were. “It essentially allowed us to map out the distribution of the light and dark plumage,” said Dr Smithwick. In addition to the bandit mask, the researchers identified counter-shading on the body and a banded tail. These patterns can tell scientists lots about the animal, its behaviour, and habitat. Counter-shading is a common form of camouflage present in modern animals. It balances out the natural patterns of light and shade cast by sunlight, making the creature appear flatter against the background. The particular way that the dinosaur was counter-shaded suggests Sinosauropteryx lived in open habitats, rather than dense forest. Sinosauropteryx could not have held the long tail in a perfectly horizontal position for long periods, which may explain why it’s banded rather than counter-shaded.